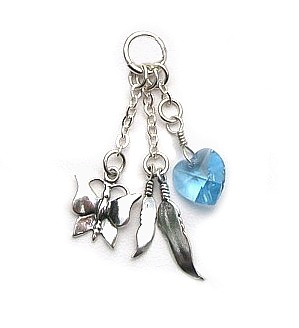 Exquisite cluster pendant, complete with Sterling Silver Butterfly, Feathers and shimmering Blue Crystal Heart. In Navajo legend, the Butterfly is a symbol of transformation. As with humans the butterfly grows in stages and shows us the courage to claim our freedom and grow to be the best we can be. To transform negative feelings into positive ones. Wear on its own on a chain. Or clip onto an Affirmation ring for even greater impact. For a chunkier look add more Spirit Charms.